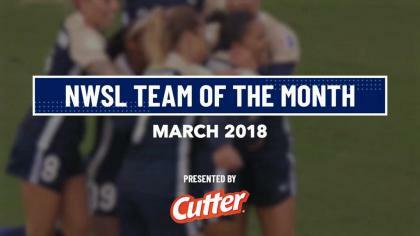 The North Carolina Courage won their 13th game of the season on Saturday, a 2-0 win over the Washington Spirit in front of a home crowd of 3,530 at Sahlen’s Stadium at WakeMed Soccer Park in Cary, North Carolina. With the win, the Courage improve to 13-5-0, with 39 points on the season. It’s the fourth straight win for the Courage. The Spirit fall to 4-10-4 with 16 points. After a scoreless first half, rookie forward Ashley Hatch scored her fifth goal of the season just seconds into the second half. Courage forward Denise O’Sullivan, newly signed and making her first start for the Courage, found Kristen Hamilton open on the right wing. Hamilton served a low cross into the center of the area. Defender Alyssa Kleiner, who had just entered the match as a substitute for the start of the second half, miscleared the ball and it fell to Hatch, who hit it past Spirit goalkeeper Stephanie Labbé to make it 1-0. In the 84th minute, the Courage scored their second goal of the game on a very unfortunate Spirit own goal. Midfielder Sam Mewis sent a high corner kick into the box. Labbé jumped for it, but didn’t get a hand on it. Spirit forward Cali Farquharson tried to head it out of danger, but her header went off the face of her teammate Kassey Kallman and redirected into the back of the net to put the Courage up 2-0. The Spirit nearly got on the board in the 93rd minute when Washington forward Mallory Pugh sent a high cross into the box. As Courage goalkeeper Katelyn Rowland came out to make a play on it, Cheyna Williams headed it over Rowland and towards the empty net, but her shot bounced off the post. Rowland made three saves to earn the shutout, her seventh clean sheet of the season. Ten of North Carolina’s 13 wins have come via shutout this season. Courage midfielder McCall Zerboni made her 100th NWSL appearance, becoming the fourth NWSL player to achieve the feat. The Courage have only conceded one goal in their last four games. They’ll next face the Dash on the road in Houston on Sunday. On Saturday morning, the Spirit announced that midfielder Kristie Mewis was not available for the game vs. the Courage due to a pending trade. The team said additional details would be available after the conclusion of the trade. The Spirit will next host the Red Stars on Saturday. Attempt missed. Meggie Dougherty Howard (Washington Spirit) right footed shot from outside the box is close, but misses to the left. Assisted by Kassey Kallman. Corner, Washington Spirit. Conceded by Lynn Williams. Cheyna Williams (Washington Spirit) hits the left post with a header from the centre of the box. Assisted by Shelina Zadorsky. Abby Dahlkemper (North Carolina Courage) is shown the yellow card for a bad foul. Arielle Ship (Washington Spirit) wins a free kick in the attacking half. Substitution, North Carolina Courage. Makenzy Doniak replaces Kristen Hamilton. Offside, North Carolina Courage. Samantha Mewis tries a through ball, but Lynn Williams is caught offside. Substitution, Washington Spirit. Arielle Ship replaces Estefanía Banini. Delay in match Kassey Kallman (Washington Spirit) because of an injury. Own Goal by Kassey Kallman, Washington Spirit. North Carolina Courage 2, Washington Spirit 0. Corner, North Carolina Courage. Conceded by Stephanie Labbé. Attempt saved. Kristen Hamilton (North Carolina Courage) right footed shot from the centre of the box is saved in the bottom left corner. Assisted by Jessica McDonald. Cali Farquharson (Washington Spirit) is shown the yellow card for a bad foul. Corner, Washington Spirit. Conceded by Abby Dahlkemper. Attempt saved. Estefanía Banini (Washington Spirit) right footed shot from the left side of the box is saved in the bottom left corner. Assisted by Meggie Dougherty Howard. Corner, North Carolina Courage. Conceded by Kassey Kallman. Attempt missed. Jessica McDonald (North Carolina Courage) right footed shot from a difficult angle on the right is high and wide to the right. Assisted by Jaelene Hinkle. Substitution, Washington Spirit. Cali Farquharson replaces Havana Solaun. Substitution, North Carolina Courage. Jessica McDonald replaces Ashley Hatch. Attempt saved. Lynn Williams (North Carolina Courage) right footed shot from the right side of the box is saved in the centre of the goal. Assisted by Denise O'Sullivan. Attempt missed. Mallory Pugh (Washington Spirit) right footed shot from outside the box is too high. Assisted by Caprice Dydasco. Denise O'Sullivan (North Carolina Courage) wins a free kick on the right wing. Offside, North Carolina Courage. McCall Zerboni tries a through ball, but Lynn Williams is caught offside. Attempt missed. Kristen Hamilton (North Carolina Courage) right footed shot from the right side of the box is close, but misses to the left. Assisted by Lynn Williams. Hand ball by Estefanía Banini (Washington Spirit). Caprice Dydasco (Washington Spirit) is shown the yellow card for a bad foul. Attempt blocked. Estefanía Banini (Washington Spirit) right footed shot from outside the box is blocked. Assisted by Havana Solaun. Goal! North Carolina Courage 1, Washington Spirit 0. Ashley Hatch (North Carolina Courage) right footed shot from the centre of the box to the bottom left corner. Substitution, Washington Spirit. Alyssa Kleiner replaces Estelle Johnson. Second Half begins North Carolina Courage 0, Washington Spirit 0. First Half ends, North Carolina Courage 0, Washington Spirit 0. Offside, Washington Spirit. Tori Huster tries a through ball, but Cheyna Williams is caught offside. Attempt saved. Estelle Johnson (Washington Spirit) left footed shot from the centre of the box is saved in the bottom right corner. Corner, Washington Spirit. Conceded by Abby Erceg. Attempt blocked. Cheyna Williams (Washington Spirit) right footed shot from the centre of the box is blocked. Assisted by Estelle Johnson with a cross. Attempt saved. Mallory Pugh (Washington Spirit) right footed shot from outside the box is saved in the centre of the goal. Assisted by Meggie Dougherty Howard. Attempt missed. Mallory Pugh (Washington Spirit) right footed shot from the left side of the box misses to the right. Assisted by Estefanía Banini following a corner. Corner, Washington Spirit. Conceded by Taylor Smith. Attempt missed. 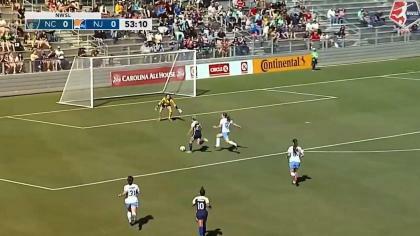 Ashley Hatch (North Carolina Courage) right footed shot from the left side of the box is close, but misses to the left. Assisted by McCall Zerboni. Attempt missed. Estelle Johnson (Washington Spirit) right footed shot from outside the box misses to the left. Assisted by Havana Solaun. Attempt missed. Abby Erceg (North Carolina Courage) left footed shot from the centre of the box is high and wide to the left. Lynn Williams (North Carolina Courage) wins a free kick on the left wing. Attempt missed. Ashley Hatch (North Carolina Courage) left footed shot from outside the box is high and wide to the left. Assisted by Kristen Hamilton. Hand ball by Cheyna Williams (Washington Spirit). Attempt saved. McCall Zerboni (North Carolina Courage) right footed shot from outside the box is saved in the centre of the goal. Assisted by Kristen Hamilton.